While Caitlin continues to dance and explore other opportunities in entertainment, she teaches young dancers throughout the country. On a trip to Mexico last year, Caitlin came across a dance program at an orphanage. She immediately volunteered to help teach. On So You Think You Can Dance, Caitlin wore Brighton earrings at rehearsals and performed Bollywood, hip-hop, pop-jazz and ballroom dances. Since SYTYCD, Caitlin has performed on stage, in films and on TV. She's also developing new projects with stars such as Paula Abdul. 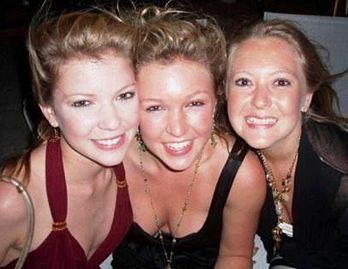 The Kinney girls: Caitlin's younger sister, Megan (center), also auditioned for SYTYCD. Older sister, Erin, practices naturopathic medicine. Flying from Los Angeles to Richmond, VA, Caitlin Kinney has a long stopover at Dallas-Fort Worth International. On her way to teach for two days at J’Adore Dance Academy, she has already ridden the Skylink twice around the airport to pass the time. Up since 4:30 in the morning, she’s sleepy as well as bored, but her tired eyes light up when she sees a Brighton Collectibles store in the terminal. Looking through the accessories, she flashes back four years to the fifth season of So You Think You Can Dance. One of 20 finalists, Caitlin wears Brighton earrings as she learns Bollywood, hip-hop, pop-jazz and ballroom routines for the first time. Not only is dancing in a hit TV show a major turning point in her career, it's also her first triumph after a potentially career-ending injury. Back in sixth grade, Caitlin tumbles on an athletic field. An accomplished gymnast, she is also enjoying soccer when a friend introduces her to acrobatic dance classes at C & C Dance Company in Bowie, MD. In high school, she falls in love with ballet at the Baltimore School for the Arts and Nutmeg Academy, where she trains with Elena Tchernichova. The famous teacher, who coached Mikhail Baryshnikov, initially scoffs at her lack of experience and healthy appetite. Yet Caitlin quickly wins her over. Various colleges offer her scholarships, but she decides to accept an apprenticeship at North Carolina Dance Theater after graduating from BSA in 2005. After being promoted to NCDT2 in 2007, she dances in 27 performances of The Nutcracker during that holiday season – and tears the labrum in her right hip. Her first doctor suggests she give up her “dancing hobby,” an unacceptable option. Determined to find “the best hip guy in the world,” her mother, Elizabeth, takes Caitlin to Steadman-Hawkins Clinic in Vail, CO. During an arthroscopic surgery there, Caitlin’s bone spurs are shaved down and torn labrum repaired. In the process of reconstructing her hip, the doctors inject 25 ccs of water into the area. "The day after the surgery, your hip looks like a giant watermelon, and then they make you get up and ride a stationary bike,” Elizabeth recalls. “Two NFL players passed out, but Caitlin made it through. She was crying and vomiting because it hurt so much, but she did it." After two weeks in the clinic, she spends four months in rehab until the summer of 2008. While the ordeal seems horrifying to others, Caitlin takes it all in stride. “I was highly medicated,” she says, with a laugh. Back on her toes, she explores possible next steps in her career. As much as she loves ballet, she realizes her style is more contemporary and acrobatic than classic. Her younger sister, Megan, is studying musical theater at the University of Miami and hears about auditions for So You Think You Can Dance. She goes to audition and encourages Caitlin to do the same. In a different city each weekend, Caitlin teaches convention-size classes throughout the fall. Both sisters make it to Las Vegas Week, but only Caitlin advances to the live shows. Elizabeth has never heard of SYTYCD, but soon realizes that nearly everyone else in their town seems to be obsessed with it. Massive watch parties take place in Annapolis each week, while she and other family members fly to Los Angeles to support Caitlin in person. She finishes in the top 12, earning a spot on the post-season tour. The Kinneys have always been hugely supportive of each other’s dreams. Caitlin’s father, Doug, a principal in a private equity firm and avid yachtsman, always says, “If you achieve your goals, you’ve sailed too close to shore.” Elizabeth says that he works very hard to provide everyone else in the family with the freedom and opportunity to make a difference in the world. In her case, she volunteers at the Light House, a support center for the homeless, for 17 years before taking on other roles and becoming its executive director in 2011. 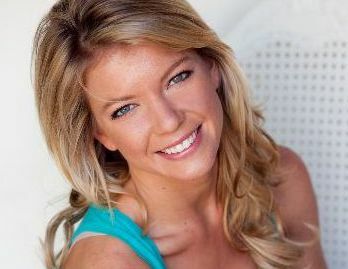 The Baltimore Sun recently recognizes her work and names her one of its 50 Women to Watch. Caitlin and her sisters get involved with the Light House at young ages, volunteering and cooking dinners. It all begins when Erin, the eldest sister, is in fourth grade. Elizabeth remembers Erin's paper about the experience. “My Mother made me hold hands with a homeless man,” she writes. “I was scared. Then I looked down and realized his hands looked just like my dad's.” Erin has grown up to be a naturopathic doctor. She recently witnesses Caitlin’s compassion and authenticity at the Light House’s “breakfast club.” The weekly Friday event is meant to motivate people and send them off to have a good day. Caitlin comes and speaks about her childhood learning disabilities. Around the room, Elizabeth can see residents relating to her struggles and being inspired by her ability to find a rewarding life path regardless. This ability to reach people and change their lives reflects Caitlin’s natural instincts for teaching. So besides performing, the next stage of her career includes teaching dance whenever the opportunity arises. Last year, she joins a friend on a trip to Mexico. They’re visiting Casa de la Esperanza, a Christian orphanage, when they discover that the EDIFY Movement is conducting a weeklong program there. She immediately leaps in to help educate and inspire kids through dance. Since she’s scheduled to travel to a different convention each weekend, she anticipates spending a lot more time waiting in airports. At least she can enjoy one diversion: Back at Dallas-Fort Worth International, she picks out a new pair of earrings. That layover gets a little brighter.